Some good and bad news for people who've heard that insects live on human eyelashes. The good news is that they don't. The bad news -- the mites that do are arachnids, not insects -- they're relatives of spiders, although they look more like worms. In fact, around 1840, British paleontologist and zoologist Sir Richard Owen, better known for coming up with the word "dinosaur," also named Demodex folliculorum, which sounds much more dignified and scientific than its translation into plain English -- "lard worm of the follicle." If you're grossed out already, read no further. Follicle mites, too small to see with the naked eye, are easily viewed under a microscope. These cigar-shaped parasites have eight short, stubby legs ending in claws, simple eyes and needle-like mouth parts. Since they feed on our dead skin cells and glandular secretions, they're classed as carnivores. Animals have mites related to ours, but Demodex follicularum lives only on humans. Although their life cycle is only 19 to 23 days, the mites accomplish a lot in that short time. Females lay up to 25 eggs in a single hair follicle, which means the population can quickly get out of hand, with mites crawling out at night in search of less crowded follicles to call home. Follicle mites don't discriminate on the basis of age, but the older you are, the more likely it is you have them. According to a June 2012 article in "Review of Ophthalmology," 84 percent of Americans age 60 or over are estimated to have follicle mites -- from age 70 on, it's a clean sweep of 100 percent. Of the 70 to 80 million Americans with blepharitis, inflammation of the eyelid that occurs most frequently around the lash line, upwards of 80 percent are thought to be infested with Demodex mites. 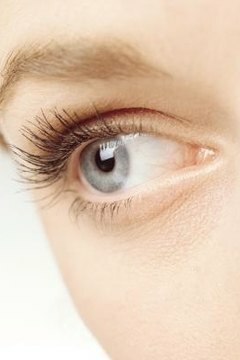 Symptoms include itchiness, especially in the morning when the nocturnal mites are crawling back home; burning; the sensation that you've got something in your eye; crusting and redness of lid margins; blurry vision; and white specks at the base of your lashes that look like dandruff. Some people with mite infestations have no symptoms while others seem to experience strong allergic reactions. In almost all cases, says ophthalmologist Dr. Steven Safran, patients need to see the mites wriggling under a microscope before they'll believe the diagnosis. The mites burrow mouth-first into follicles and hang on tight, "tails spread out along the base of the lash like little bristles," Safran says, so extracting them can be a challenge. If he pulls out an eyelash in order to get a sample and the mites don't come with it, Safran dips the lash back into the follicle in hopes of coaxing some of them to adhere to it. Demodex mites used to be regarded as a harmless aspect of the human body's ecosystem, but evidence linking them to intractable blepharitis has been mounting. The connection between the chronic, disfiguring skin disease rosacea and the mites is well known, but according to Dr. Scheffer C.G. Tseng, director of Miami's Ocular Surface Center, many doctors still don't recognize Demodex as a potential cause of blepharitis. "We believe this is a disease people should pay a great deal of attention to," he says. The first line of defense is good hygiene, Tseng says, but many people aren't as conscientious about washing their eye area as thoroughly as other parts of the body. Mites can be transmitted between people, so to get rid of them, you have to kill all of them; otherwise, the population will keep increasing. Tseng advises washing bedding at least once a week -- if any mites are present, a hot dryer will kill them. Since tea tree oil has been found to get rid of mites, Tseng recommends a daily face scrub with a 50 percent dilution and lid massage with a tea tree 5 percent ointment. If you're having eye problems, though, consult a doctor. National Geographic: Body Beasts: No man is an island. He is an ecosystem. Time Health & Family: Rosacea: Caused by Mite Poop in Your Facial Pores?